The Blue Ridge Mountains of North Carolina are filled with beautiful minerals and Gem Stones North Carolina, which makes this area the perfect place for our Jewelry Store in North Carolina. More than just the owners of a jewelry store, we are Custom Jewelry Designers who produce some of the finest Artisan Gemstone Jewelry available. We specialize in transforming Rough Gem Stones into sparkling specimens which we then put to good use in our Unique Gemstone Jewelry. But how exactly do we turn Rough Gem Stones into Designer Inspired Gemstone Jewelry? The process is a lengthy one, which begins with our Lapidary Equipment and Faceting Supplies and ends with Custom Fine Jewelry. If you find yourself asking "What is Faceting?" read on to find out more. The word facet is used to describe a flat surface on a geometric shape. Many crystals are naturally facetted, but Faceting Gemstones properly will cause them to reflect more light, thus improving their appearances. 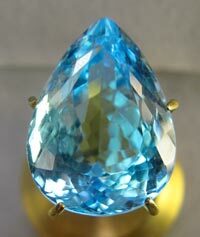 The act of faceting has been considered an art form for centuries and has been perfected over the years. Today, with the use of a Faceting Wheel and Faceting Machine, it is possible to turn even the roughest North Carolina Gemstones into Semi Precious Stones Jewelry. Here at Facets, we rely on the Fac-Ette GemMaster II to produce all of the different Faceting Shapes we offer. This state-of-the-art Faceting Machine gives us the ability to produce the Unique Gemstone Jewelry for which we are known by allowing us to turn rough North Carolina Gemstones into breathtaking works of art. We offer a variety of Designer Gemstone Jewelry, Colored Gemstone Jewelry, and even Custom Wedding Gemstone Jewelry or Custom Handmade Jewelry Earrings. If you're searching for that perfect Custom Faceted Fine Gemstone Necklace, ring, or bracelet, we invite you to visit our Jewelry Store in North Carolina. Facets of Foscoe has been impressing the public with our fine Artisan Gemstone Jewelry and Natural Gemstone Jewelry Silver for three decades. We invite you to browse our inventory of Beautiful and Sought After Handmade Jewelry. If we don't have what you're looking for, contact us today to discuss your ideas for your next statement piece.